From capital town Bhubaneswar, it is around 550+ km by road; there are many private buses run daily to Dharmagarh and Kokasara, which are the nearest towns to this place. Otherwise, the nearest railway station is Junagarh; where daily train is available from Bhubaneswar. 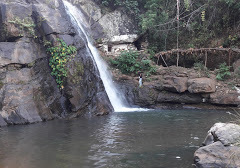 The Gudahandi hills are situated in the vicinity of Khaligarh, a tiny villoage close to the Koraput District boarder, about 17.6 K.Ms North-East of Ampani. Ampani is 77 K.Ms from Bhawanipatna on the road towards Nawarangpur. In the Gudahandi hills are some ancient caves bearing pictographic paintings of remote antiquity, Khaligarh is a very out of the way place, the 17.6 K.Ms of Ampani being cart tracxt parts of which pass through dense forest. Three small hills, all of curved length, are together known as the Gudahandi hills. The North and the South hills join eachother in the East leaving a courtyard like vally in between which is open towards the West. This valley is paved by a huge block of stone slopping down to the East. Just at the foot of these hills facing the valley are rows of caves. Excepting one in the North, all the caves are small in size.Although at places hewed to shape by human hand they generally appear to have been formed bynature itself in red slate stone. Pictographic paintings in Red and Black colours appear at the entrances of some of caves in the Southern row. These have not yet been thoroughly studied but it is generally surmised that they bear approximately to the picture scripts of the Indus Valley Civilisation. Besides Gudahandi in Kalahandi District, Bikramkhol and Ulapgarh in Sambalpur District and Naraj in Cuttack District also possess some writings resembling pictographic paintings. a fact indicative of pre-historic man’s habitation in Orissa. The third hill extending North to South stands like a way to the immediate West of the Valley. But as this hill does not join with the other two, the valley is approachable from the North as well as from the South by a narrow pass.All the three hills taken together have the appearance of a pot with a lid on. The name Gudahandi, meaning a pot, for molasses, may have its origin in the impression its shape apprently conveys. A rivulet named Behera flows past the village. There are remains of a veryold dam across this revulet, local people call it the work of Bhima, the second of the Pandavas. Amathguda is a fort, situated on the right bank of the river Tel to the place where the road leading towards Balangir crosses the river. It is now incomplete ruins.Nothing is definitely known about this fort as its remains have not yet been investigated. The fort, presumably, was of considerable strategic importance in view of the fact that it stood close to the point where the river was fordedd since ancient time.Theroad which spanned the river by a low bridge ran almost on the old route.Another bridge was constructed abo9ut a few metres away from the old ruined bridge. Portions of this new bridge have been washed away by the highfloods in river Tel that occured in 1977. 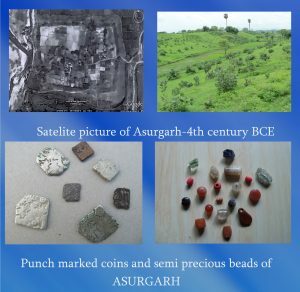 Asurgarh is a small village situated in Narla Police Station area and is knownfor the remains of old fort. It is 5 KM from Narla and 3 Kms from Rupra Road Railway station. Not far from the village is an oval shaped tank nearly 200 acres (80.9374 Hects.) in area. Between the tank and the river Sandul lie the ruins of a fort called Asurgarh. The fort in its original shape was rectangular covering a wide extent of land encircled by a boat. It has four entrances one each on the East, West, South and North where the deities Ganga Devi, Kala Pahad, Vaishnavi and Budharaja are respectively being worshipped. Inside the fort, there is a small halmets where Goddess Dokari (Literally means “Old Lady”), the presiding deity of the fort is worshipped. The central part of the fort has a higher elevation with a round on it, which is supposed to be the ruins of a palace. Local people believe that the fort was the seal of a demon kind called GOSINHA DAITYA. 77 K.Ms from Bhawanipatna the picturesque Ampani hills present a panoramic view of nature. A frolicking vally called “Haladigundi” in thishill range exhibits some peculiar features due to the reflected rays on the sun. In the morning and evening the objects of vision appear yellow. The whole area abounds in spotted deer, Sambar and Black Panthers who can be seen at the Behera reservoir. 5 K.Ms away are the pre-historic cave paintings at Gudahandi. 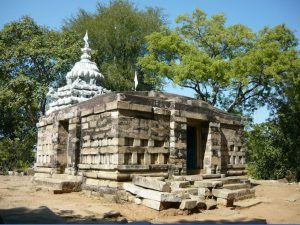 Situated on the confluence of the river Tel and Uttei, two tributaries of the river Mahanadi, Belkhandi has gained prominence as a centre of religious activities and archaeological importance with a picture-sque site. Besides the temples now standing therein, ruuins of 12th Century monuments have been excavated from there in the recent past.Among the sculptures unearthed images of Sapta Matruka (Seven Mother Goddesses) and Uma Maheswar arenote-worthy. The ruins of Belkhandi are preserved in a small museum adjacent to the temple premises. It is also an ideal site for an outing. This place is 67 K.Ms from Bhawanipatna. The old Capital of the Ex-State of Kalahandi. Junagarh was a well built fort, the fortified area has a number of temples with Oriya inscriptions. 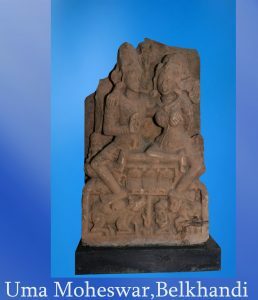 This is a place which has sculptural evidence of the “Sati-Rite” which was prevalent in medieval India and was stopped during the British Rule by Lord William Bentick. The sculptures are identified as Sati Pillars which can make interesting study. Junagarh is 26 K.Ms from Bhawanipatna. 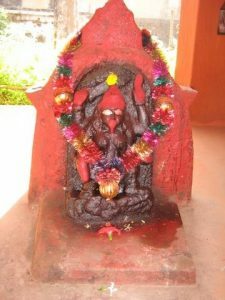 Maa Lankeswari is the Aaradhy Devi. 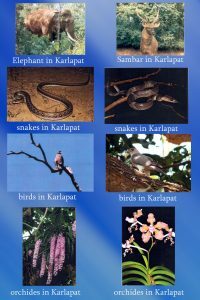 Karlapat is a small village in Th.Rampur Police Station area. 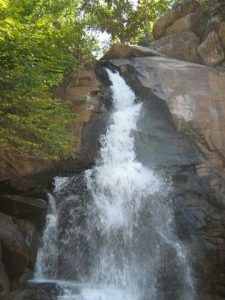 Nearby, there is a Water fall called “Khandual” fall at the foot of a hill the top of which is the abode of a female deity called “Khandua”. The fall was formerly utilised in some indigenous manner of operating a crushing mill. At Karlapat there is a temple dedicated to “MANIKESWARI”. MOHANGIRI Mohangiri is a village in Madanpur-Rampur Police Station close to Boudh-Kandhamals District border in the North-East corner of the district. It is 35 K.Ms from Madanpur Rampur. The village is near a hill stream called Kali Ganga. A dilapidated Siva Temple stands on the Bank of the stream. There are a few short epigraphic records on its walls and pillars. 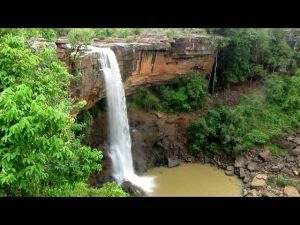 Rabandarh is a place of great scenic beauty lying about 12.8 K.Ms from Bhawanipatna and approachable by a dusty road. It is named after a small water fall inside a mountain gorge. The panorama around provides some delightful consrasts of scenery, in mountains and over looking dales, in bore rocks and thick forests and in the eternal calmness of the surroundings broken by the music of the fall. Despite bad communications picnic parties some times visit the place from Bhawanipatna as there is no market nearby. The stream which creats the fall almost dries up during the hot season. Down stream, a Minor Irrigation Project utilizes its water for agriculture purposes.